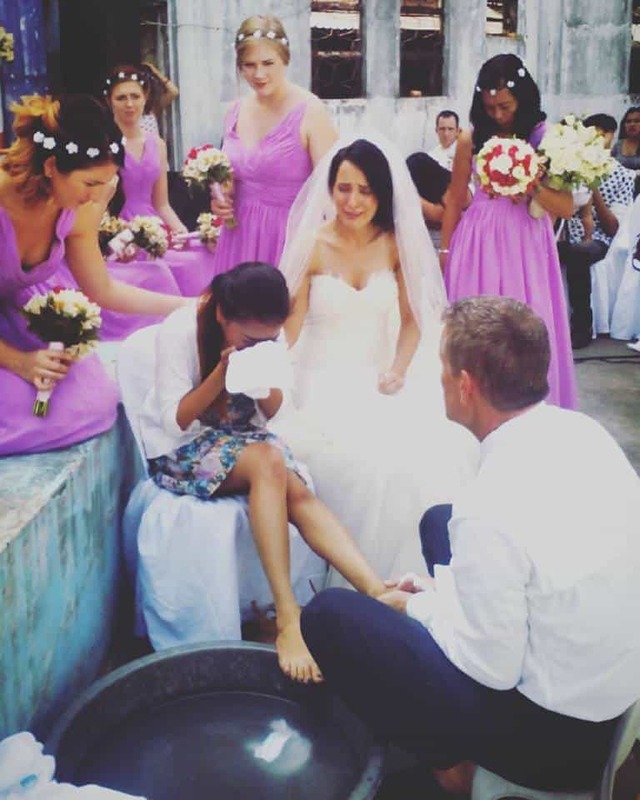 Bride & Groom Wash The Feet Of Bar Workers On Their Wedding Day And It Was Beautiful! What is your dream wedding? I believe each one of us, at some point in our lives, dreams of having a perfect wedding. Typically, we would want to have a beautiful location, wear the best clothing with a glamorous theme and celebrate it with the most important people in our lives. Perhaps we would also look forward to the gifts we would receive. Maybe we would want to remember our wedding day as a day filled with fun and laughter—whatever would make the wedding most memorable. Not because we want to show off, but because we want it to be the best day of our lives – seeing that it only happens once! However, Melissa and Randy Howard broke this typical ideal wedding concept when they invited strangers/ bar workers into their reception and celebrated in the most extraordinary way. “Melissa, if you could do anything for your wedding, what would you do? Who would you want to be there at your wedding?” he asked. “Well if I could do anything from my wedding, and I would have my Filipino girls there. The girls that I’ve helped rescue,” she answered. And one day during worship, Melissa heard God convicting her that if she’s going to get married in the Philippines, she should invite girls working in the bars —girls that have not yet been rescued. And to let these girls meet those who have already been rescued and begin their journey of healing. So they went to the bars and invited the girls. They even held their wedding in an old church with no roof because God impressed onto Randy that it was meant to be under open heavens. “We can experience Heaven on this earth and the things of Him are here for us to experience. And so the no roof open heavens thought became really, really huge,” Randy revealed teary-eyed. “The church we’re being married in, has not been restored after decades and decades. 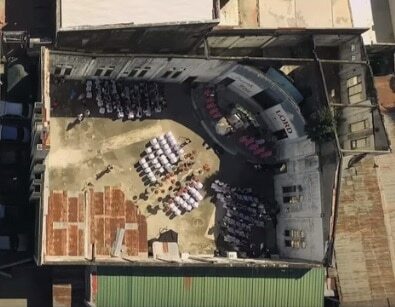 There’s never been a roof put back on that building. It’s completely unrestored, just like these girls. God will do a great thing and Jesus will be there and things will happen that we cannot imagine,” he continued. 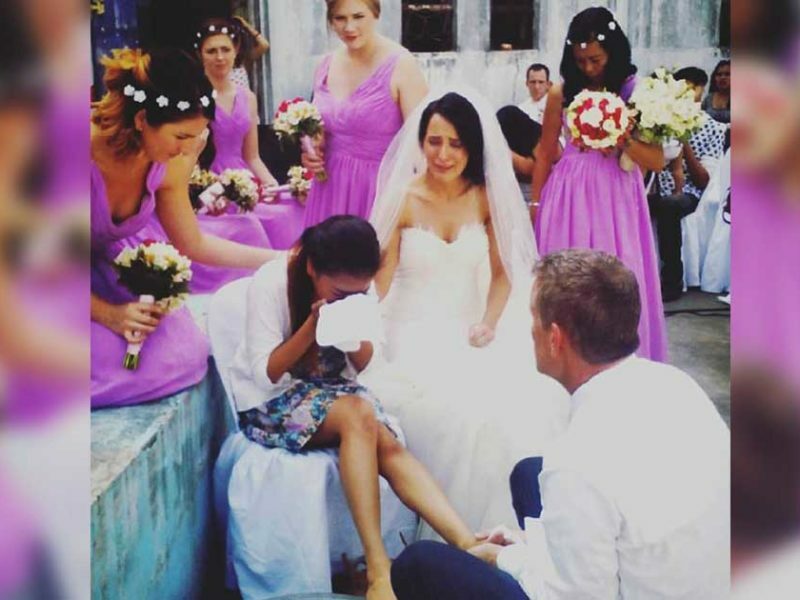 On their wedding day, the bride and groom served the girls they invited. They wanted to show the love of Christ to them. “We’re gonna do our best to represent to them what Jesus would be for them,” he said. Even though the girls were strangers to them, both Melissa and Randy washed their feet as if they had known them for a long time. The whole room filled with tears. There was so much love from God. Randy and Melissa’s wedding video below is truly heart-melting! It will make you cry too.